BBTS has Hot Toys, Dark Energon, Enterbay T-800, Transformers, NECA Predator, Imports & More! So for anyone who doesn’t know, these are Japanese-made repaints of the Fall of Cybertron-based figures that have already been released here in the States. They feature shinier (and more detailed?) paint jobs. I’ve been trying to convince myself not to buy this – I don’t have the Hasbro version, and that paint job just looks so damned nice. I’ve got the game but haven’t started playing it yet…once I do, I may not be entirely able to resist this bad boy. Anyone who does have him – what do you think? Worth owning? Is this version overpriced, even with the nicer paint job? And for anyone who’s wondering, yes, I would love to own the TRU exclusive Optimus, but it doesn’t quite hit the proper ratio of price to desire for me. If I could get it for, say, $80, I’d probably crack like an egg. Hot Toys has announced that they will be releasing Hall of Armor bays just like in “Iron Man 2″, so that you can store your figures like Tony does his armors. Each bay stands about 13.5” tall with light-up LED light functions, an acrylic door plate and more. We have them listed singly at $124.99 ($5 off of the MSRP), as a Set of 4 at $434.99 ($35 off of the MSRP) and as a Set of 7 at $739.99 ($60 off of the MSRP). Enterbay is releasing a new version of their 1/4 scale T-800 figure. This version includes a battle-damaged head as well as damaged and regular left arms. The outfit also shows the battle damage, and the figure comes with weapons and other accessories too. This figure is listed at $499.99. This 22.5″ tall figure has the Baroness in her blue and black leather outfit, with an assault rifle held vertically in her right hand. She stands atop a Cobra sigil base and is listed at $349.99, $10 off the MSRP. This new versions is done in a black and purple color scheme, and can attach to the AM-25 Nemesis Prime figure. This Japanese Exclusive is priced at $89.99. Takara has announced the second of their Mito Matrices. This version is silver with a black matrix shell and clear matrix stone, and is listed at $34.99. The first release in Master Mind Creations’ Reformatted line is Hexatron. He can change from robot to winged wolf, APC, tank, star fighter and laser gun forms. He stands 9.5″ tall and is priced at $134.99. IGear is releasing a second version of their Warrior Specialist. This one is titled the Patrol Specialist and includes an extra new head (along with the original head), a handgun and new detailing. It is limited to 500 pieces and is priced at $99.99. If you were interested in it before but shied away from the price tag and all of the extra accessories, now is your chance to pick him up at a lower price. NECA has announced a second wave of their popular 1/4 scale Predator figures. This assortment includes the Unmasked City Hunter Predator and Guardian Predator; each is limited to 5000 pieces, and we have them listed at $179.99 for the set of 2, or $94.99 each singly. These 16 cm tall statues are the result of a collaboration between illustrator Po Wen and sculptor PKKing. They are resin-cast and individually numbered, and each version is listed at $199.99. Another batch of figures and model kits from Bandai has gone up for pre-order. This list includes New Master Grade kits for the Sinanju Stein and the ReZEL Type-C, along with new 1/144 scale High Grade kits, 1/144 System Base kits to store your figures and models, 1/35 scale Code Geass kits and SD Gundam kits of the Delta Plus and Unicorn Gundam 2 Banshee. We also have a new batch of import exclusive figures listed. These include a new Robot Damashii Amon Duule Stack from Heavy metal L-Gaim at $139.99, a Miku Hatsune Nendoroid Petite Cafe Set at $89.99, a Childhood version of Gintoki Sakata G.E.M. Scale Figure at $159.99, Chibi Arts Sinbad from Magi at $84.99, a Miho Nishizumi Beach Queens Limited Version Figure at $109.99 and S.H. Figuarts figures of Space Sheriff Gavan at $96.99, Ohara Daijirou from KochiKame at $93.99, Kamen Rider Nega Den-O at $84.99 and Kamen Rider Verde at $82.99. This figure of the title character from the 1989 anime Jushin Liger comes loaded with accessories such as golden wings, an alternate head, alternate hands, a golden sword and shield, a display base and more. We have this figure listed at $192.99. This character from Puella Magi Madoka Magica is the subject of the latest Real Action Heroes announcement, She will stand about 27.5 cm tall, comes with a gun and other accessories, and is priced at $264.99. DC and Classic Imports have gotten together to release these character-themed sleeved blankets. Each is done with the body of the superhero coming up to the top edge of the blanket, as if you are wearing their costume; the Batman Cozy even has a cowl at the top. Each is listed at $27.99. A variety of new pre-orders are up for Freeze’s excellent line of TF and GI Joe t-shirts. We have designs from G1, Fall of Cybertron, Cobra and TF / GI Joe combinations available, so be sure to take a peek at all these new items and grab your favorites. Dragon continues its line of model kits from “The Avengers” with this new Battle Version of Tony Stark in the Iron Man Mk VII Armor. We have this version in unpainted at $67.99, and painted at $119.99. This new listing is for the grey costume X-Force version of Deadpool. His exposed skulltop provides places to stick your writing implements, and also comes with two shuriken-shaped erasers and a soft plastic arrow fletching cap to make more interesting displays. This item is listed at $94.99, $4 off the MSRP. With the rumors swirling about the upcoming Star trek sequel, this is a great time to get your pre-order in for one of the original Star Trek villains in the form of this 8″ maxi-bust. Khan is shown as Ricardo Montalban played him in “Star Trek II: The Wrath of Khan”, and we have him listed at $89.99, $10 off of the MSRP. Diamond is distributing a number of new Pac-Man and Tetris accessories to satisfy your nostalgic video-game needs. The Pac-Man line adds a Speaker at $17.99, a Moneybox with Sound at $17.99, a Magnet Set at $4.99, a Maze Mug at $10.99, a Washbag at $8.99 and a pair of Egg Cups at $8.99, while the Tetris line adds a 7-Piece Desk Tidy Set at $26.99, Cufflinks and a Logo Mug at $8.99 each, a Magnet Set at $4.99 and a Mini Jigsaw Puzzle at $6.99. In addition to these, this list includes a Chainsaw Pizza Cutter priced at $6.99, just for fun. The first releases from the upcoming Hunger Games sequel have been listed for pre-orders. We have the Shuffling the Deck Card Game at $9.99, the Seeds of Rebellion Board Game at $24.99 and the Connect with Pieces Puzzle Building Game at $12.99. Three new zombie items are listed now. In addition to the Z-Gal and Z-Guy Zombie Apocalypse Pillow Pals at $27.99 each, we also have a Zombie Figural Bottle Opener at $4.99. The second part of the BigBadToyStore Dark Energon exclusives has arrived. The Voyager Set includes Optimus Prime and Dark Energon Megatron along with the “Loose Cannons” DVD Episode, and is listed at $49.99; we also have each figure listed singly, priced at $29.99 each. This exclusive comes courtesy of Million Publishing. It uses the Grapple body and combines it with the later Artfire color scheme, as well as giving him two Targetmasters – Nightstick and Sparks. We have this exclusive listed at $149.99. Our first shipment of Takara Generations Fall of Cybertron Figures has arrived. 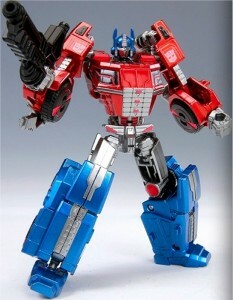 These versions of Optimus prime have new paintjobs and are priced at $37.99 each. The two new Arms Micron Five-Packs have arrived as well. We have AMW13 Autobot Five-Pack and AMW14 Decepticon Five-Pack each available, priced at $24.99 per five-pack. This Asian exclusive box set includes both the AM-01 Optimus Prime and the AM-19 Gaia Unicron. You can display them separately or merged, or just keep them in the unique packaging for a mint-in-box display. This set is priced at $139.99. This popular set is back in stock. The trailer can attach to the Nemesis Prime truck mode and become an armor suit for him in robot mode. We have this set listed at $109.99. We have been able to locate a small restock quantity of this set. It includes a laser rifle that transforms into a gas tank as well as a Matrix with Housing that can go into the figure’s chest. We have this set listed at $34.99. This set of familiar transforming minibots consists of a hovercraft and an airplane, each of which transform into robots as well. We have the set of two listed at $39.99. These two new accessory kits can be used to alter your Junkions into new Medic or Warrior versions. Each comes with additional armor, a spiked shield, a new head (each is different) and weapons or accessories, and we have them priced at $34.99 singly, or at $64.99 for the set of Warrior and Medic kits. We have received small quantities of the latest MOTU Classics figures for the benefit of our international and other customers. This month brings Classics Granamyr at $129.99, Classics Procrustus at $54.99, Classics Castle Grayskull Diorama Stands Set of 5 at $19.99, Classics Mosquitor at $34.99, Classics King Hssss at $35.99, Classics Skeletor Re-Issue 02 at $35.99, Classics He-Man Re-Issue 02 at $35.99, Classics Sy-Klone at $25.00 and Classics Mer-Man Re-Issue at $29.99. The final three-pack in the JLU line has been released. This one includes three new figures – Dr. Destiny, Firefly and Toyman – and is listed at $48.99. Don’t miss out on this set that completes the collection. The Metal Men sub-line can now be completed with the releases of Lead and the Platinum & Tin set. We have both in stock now, with Lead priced at $54.99 and Platinum & Tin at $29.99. A number of new Beast Saga items have arrived. We have the BS21 Starter Set at $24.99, the BS22 Random Booster at $7.99 (or the Case of 24 BS22 Random Boosters at $179.99), the BS23 Panikusu at $7.99, the BS26 Magic Rod Booster D at $5.99 and the BS27 Tank and BS28 Jyro at $19.99 each. Executive Replicas’ first release in the Killer Klowns line is Shorty. This fellow wears a yellow jumpsuit and he comes with alternate hands, a Klown Ray Gun and more, and is listed at $21.99, $3 off the MSRP. This military-colored mech is done in 1:48 scale and can exchange parts with other figures in the series. We have T-Rex listed at $44.99. I can’t vouch for the alternate deco, but for my two cents, that mold is REALLY dinky in person. I know there’s no real sense of scale in Transformers but that figure is EAPECIALLY small, even for a modern Deluxe figure. I think they could technically be called MICRO-MACHINES now. BAZINGA! The figure is too small and underwhelming, nomatter the paint. I much prefer the War for Cybertron figure. Funny you should mention $80 as the sweet spot for TRU Optimus, before their price bump and with a Rewards R Us coupon, I was able to snag him for $79.99. At that price, he was the crown jewel of my 2012 toy purchases. That 20% off coupon was a godsend! Also the fact that TRU offered FREE lay-a-way if purchased before their cut-off date. In all seriousness, Transformers have been sloly shrinking. Today's "Deluxe" class (the $10-$15 price range) figures are akin to the "Scout" class ($5-$7 price range) figures from a few years back. Maybe beause I haven't played the games, but most of the FOC Bots do not interest me. Other than Shockwave, and that glorious Grimlock. The Prime pictured above does have a pretty sweet paint job though! The worst part, the toys shrink… and the price grows…. None of the FoC TF designs work for me, so they're an easy pass. FoC Grimlock is tempting, but he's just too small. I love my Mp10 Optimus. I bought the Japanese version last year at $130 shipped, so the TRU one for $100 feels like a steal to me. It may be my favorite TF of all time and IMHO it's the perfect representation of Prime. The only drawback has to do with the folding cannon: the barrel doesn't lock in to place, so it tends to droop in Primes hand. If they could produce this exact same design at about 1/3 the size, it'd be my ideal prime for scale with the majority of TFs. I'd never want another.